Onyeabo Obi, widely regarded as among the three most effective senators in the Second Republic of 1979 to 1983 — the others being Abraham Adesanya and Emeka Echeruo — made a soul-stirring statement to the Igbo recently. Senator Obi, according to Donac Pilot, a publication of the Anglican Diocese of Nnewi in Anambra State, has strongly advised Ndigbo against putting all their eggs in one basket as regards the 2019 general election. His message couldn’t get to many Igbo because, as the aphorism goes, the medium is the message. The newspaper is not well known. It is, of course, only poor thinking and an awful strategy that could lead any persons to attempt to get Ndigbo, highly reputed across the globe for republicanism, to embrace in the 21st century what social scientists call groupthink. Groupthink may just be defined as social conformity, which is the enemy of innovation, creativity and rapid progress. Asian countries and territories have been making fantastic progress since they began to question and abandon old cultural values like groupthink. Propagandists, mind benders and autocrats love groupthink because the victims cannot challenge them. Against this backdrop, it is curious that the leadership of Ohanaeze Ndigbo, the apex socio-cultural organisation of the Igbo, could still indulge in the old and risky practice of endorsing a presidential candidate in every general election and ordering all Igbo to comply. As Senator Obi has adumbrated above, African leaders are vengeful. In the inimitable language of the late Professor Ali Mazrui, the most published African scholar, African leaders have a long memory of hate. They reward those who voted for them and severely punish those who didn’t. 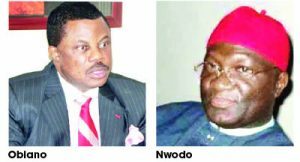 Governor Willie Obiano of Anambra State deserves praise for calling the attention of the Ohanaeze leadership to the dangerous enterprise of endorsement of a particular candidate during an election. At the meeting of Ohanaeze’s inner caucus, known as Ime Obi, on Friday, January 25, Governor Obiano had planned to counsel participants not to adopt any of the candidates in the February 16 vote because it is not in the strategic interest of the Igbo for their apex socio-cultural organisation to publicly back a particular candidate. In the introduction to the second edition of his great novel, Arrow of God, Professor Chinua Achebe resists the temptation to name this novel his favourite, even though, according to him, he could be caught rereading it more than any other work of his. Prof. Achebe notes that no wise parent proclaims any of his or her children the favourite in public without consequences. No wonder, once the Ohanaeze president announced the adoption of a candidate, leading Ohanaeze members like the secretary-general rose against the action, which is now threatening the organisation’s unity. Obiano foresaw this crisis and appropriately advised against such an endorsement. It is painful, therefore, that the Anambra delegation sent by Governor Obiano to canvass the state’s position of neutrality couldn’t because the meeting in Enugu had ended long before the time it was announced it would hold. Indeed, both the processes leading to the Ime Obi meeting and the outcome are what the former British Prime Minister, Winston Churchill, would describe as a conundrum wrapped in mystery. They are truly baffling. Historians may never understand why the Ohanaeze leadership would uncompromisingly insist on holding the Ime Obi meeting on January 25, the very day Nigeria’s President was leading the nation to inaugurate a mausoleum built in Onitsha, Anambra State, in memory of Dr. Nnamdi Azikiwe, who led Nigeria to independence in 1960 and had served as the country’s first indigenous Governor-General and the first Senate President and was to become the first President of the Federal Republic of Nigeria on October 1, 1963. What was so sacrosanct about January 25 that the Ohanaeze leadership couldn’t shift the meeting by two or three days? If the Federal Government was honouring Zik in Lagos where he grew up and Afenifere chose the same day to hold a meeting that could deny statutory members of its inner caucus an opportunity to attend and refused all entreaties to postpone it, Nwodo’s Ohanaeze would have loudly and dramatically condemned it as “a calculated attempt to humiliate the Igbo nation.” If Nigeria was honouring Zik at Zungeru in Niger State, where he was born and the Arewa Consultative Assembly elected to hold a crucial meeting the same time, which could prevent key people from participating, Nwodo’s Ohanaeze would have denounced it sensationally as part “of the grand design to marginalise Ndigbo in the national scheme of things.” But it is now Igbo elements like Nwodo dancing so joyously on the grave of the greatest Nigerian ever. Good a thing that there are thoughtful and farsighted Igbo leaders like Senator Onyeabo Obi and Governor Obiano who can say no to sacrilege and courageously chart a new direction for Ndigbo. Obiano, for one, has declared November 16 a work-free day in Anambra and has been campaigning for the Federal Government to make Zik’s birthday a national holiday, as Ghanaians have done in memory of Kwame Nkrumah, Ghana’s first president, who was tutored and mentored by Zik. As the Great Zik wrote in 1983, history will vindicate the just. These greedy Anambra elites with their ingrate governor should cast their votes in favour of whosoever they fancy and leave the generality of the Igbos with the choice they have made.